Amir Farajian, associate professor of mechanical and materials engineering. A $91,000 award from the Department of Defense to buy state-of-the-art equipment for the study of atom-thin sheets of carbon for materials that could be used in electronics and aircraft has been won by a Wright State University engineering researcher. The focus of Farajian’s research is computational nanoscience and nanotechnology, which is the study and application of extremely tiny systems. For example, two-dimensional (2D) nanomaterials, such as graphene have thickness of just one atom, which gives them unique properties that can be used in scientific fields such as chemistry, biology, physics, engineering and materials science. The research has applications in nano- and molecular electronics, solar cell materials and transport and thermal properties important in aerospace. Possible applications include incorporating materials into the matrix of composites that are used to build aircraft or aircraft parts to improve mechanical strength or the ability to resist high temperatures. The Department of Defense issued $53 million in instrumentation awards to 175 university researchers doing cutting-edge research important to national defense at 91 institutions in 36 states. The annual awards process is highly competitive. The Department of Defense received 671 proposals, requesting $254 million in funding, of which the most meritorious proposals were selected. Farajian, his co-principal investigator Olga Pupysheva and a team of student researchers will work with graphene, which consists of a single layer of carbon atoms arranged in a hexagonal lattice. The equipment will enable the researchers to characterize materials in an extremely accurate way. There are three different sets of equipment. The first was scheduled to arrive Oct. 20. Farajian earned his bachelor’s and master’s degrees in his native Iran and his Ph.D. in materials science from Tohoku University in Japan. 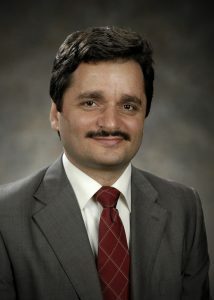 He worked as a research scientist at Rice University in Texas before joining the faculty at Wright State in 2007. Farajian has taught materials and mechanical engineering courses at the Wright State College of Engineering and Computer Science. He is teaching graduate courses in hydrogen energy and advanced physical properties.